Get ready for a tug of war: Capt. 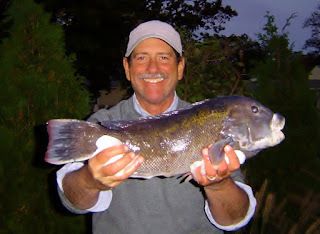 Dave Monti with a 23” tautog he caught at General Rock in North Kingstown, RI last year. Tautog fishing is great family fun: Gisele Golembeski with a tautog she and her husband Rich caught off Narragansett, RI near Whale Rock. 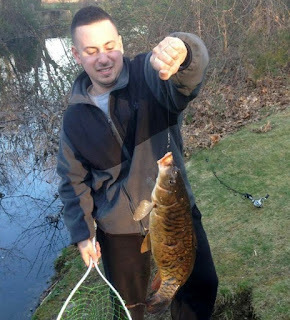 Carp bite good: Paul Marino caught this 10 pound carp on a bread ball in the Blackstone River this weekend. The Rhode Island Department of Environmental Management (DEM) regulates tautog fishing. Tautog has a split season. The spring season ends May 31 so now is the time to fish for them as they are illegal to fish June 1 to July 31 during spawning season. Fish have to be sixteen inches. The catch limit for private recreational anglers on and before April 15 to May 31 and then August 1 to October 18 is three fish/person/day, which jumps to six fish/person/day on October 19 to December 15. However, there is a ten fish per boat limit. The boat limit does not apply to charter and party boats. 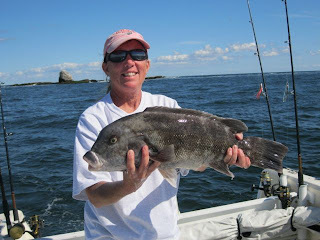 Over the past couple of years, I have asked noted Rhode Island anglers, fishing guides, charter captains and bait & tackle shop owners in Rhode Island for tautog fishing tips. Here is what some of them had to say about tautog fishing tips. Boat placement is important. Find structure with electronics, estimate wind/drift direction and anchor up current from where you want to fish and drift back to the spot as the anchor is setting. Once in position, fish all sides of the boat. Fish all sides of the boat casting a bit to cover as much area as you can. If still no bites, let some anchor line out a couple of times to change your position, if still no bites it is time to move the vessel. Where to fish for tautog. From shore, look for rocky coastline like Beavertail Point on Jamestown, locations off Newport and off jetties at South County beaches. From a boat, I have had good luck at Plum Point light house next to the Jamestown Bridge, the rock wall north of Coddington Cove in Portsmouth, off Hope Island, around Brenton Reef in Newport, Whale Rock, Ohio Ledge in the East Passage, General Rock in North Kingstown and any other places there is structure, debris, rock clusters, wrecks, etc. Fishing in the early spring or fall can be cold. Dress appropriately. If you dress in layers, you can take them off as the sun warms you.. Do not forget the gloves, I usually have at least four pair with me … water proof neoprene gloves, light cotton gloves, heavy winter gloves… whatever the conditions, be ready, and of course the gloves get wet. Fishing exploded this week on the Bay and along coastal shores as the water was warmed to the mid to upper fifty’s range by nice weather. Summer flounder (fluke) fishing has not received much attention when it opened May 1. Anglers have targeted striped bass and tautog, however, some encouraging news was reported by John Wunner with a fisherman at the Wickford boat ramp coming in with two keeper fluke, one of them was 25”. Spring (fishing?) break: school vacation turned out to be a fishing holiday for Carlin O’Hara of Cranston. 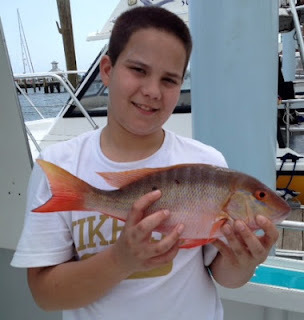 The Rhode Island angler landed red and yellowtail snapper off Riviera Beach (near West Palm Beach) in Florida while on vacation with his family. Boating talk: Rick Bellavance, president of the RI Party & Charter Boat, and Kim Hapgood of Sail Newport at SeaPlan’s marine industry boating workshop held last week at Save the Bay. Over the past month there has been a lot of talk about recreational fishing, and a lot of talk about boating, and the impact they have on Rhode Island. As one might expect these industries bolster tourism… and come to find out… they do have a huge direct impact on our economy. But the greatest impact for me is not financial, but rather the recreational benefits… the peace of mind one gets by being close to or on the water and the fun and bonding that goes on between friends and family members when they are fishing or boating in Rhode Island. 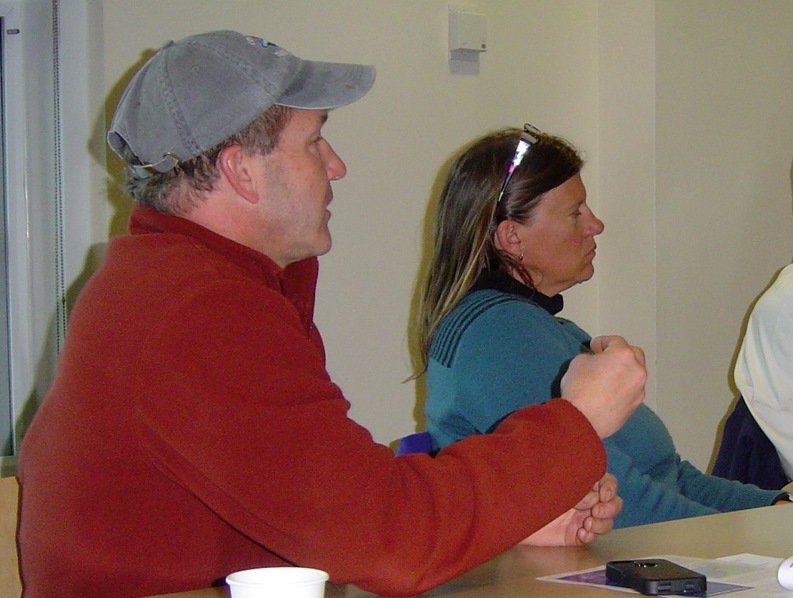 All the fishing and boating talk started this month with the 2013 Southern New England Recreational Fishing Symposium held on April 2 in Warwick. This symposium was hosted by the Rhode Island Saltwater Anglers Association in conjunction with the URI Coastal Institute. One week later the symposium was followed by the release of a new for-hire (charter and party boat) economic impact study by the National Oceanographic an d Atmospheric Administration’s (NOAA) regional research center. And then, last week, preliminary results for the 2012 Northeast Recreational Boater Survey were released at a coastal boating and marine industry workshop held at Save the Bay’s headquarters in Providence. The workshop and study were sponsored by SeaPlan, an independent nonprofit ocean science and policy group. Add it all up and the economic impact recreational fishing and boating have on Rhode Island is very impressive. NOAA’s estimate on the annual economic impact of recreational fishing in Rhode Island totaled $179-million. In the Northeast the impact of the for-hire industry was estimated at $334-million and preliminary data from the 2012 Northeast Recreational Boater Survey indicated that the economic impact of recreational boating could be as high as $220-million in Rhode Island. The data, much of it available for the first time, tells a story. Even though some industry segments are missing and others may be counted twice, the data leads me to believe that it is in the best interest of all Rhode Islanders to advocate for the boating industry, recreational fishing, the environment and fish that live in our waters because they have a great impact on all of us. Now add the impact of commercial fishing and boating (shipping) and the economic impact is all that much greater. Visit the Rhode Island Saltwater Anglers Association website for results of the Recreational Fishing Symposium at www.risaa.org (symposium highlights soon to be posted), visit NOAA’s website for information on the recreational fishing and for-hire industry studies at www.nefsc.noaa.gov/publications . Final results of SeaPlan’s boater survey is not complete yet but their website for the future is www.seaplan.org. Visit Rocky Point Park Saturday, May 4, at noon to see officials reel in ideas for the development of Rocky Point Park. The reeling in event will be held at the beach in front of what was the salt water pool just inside the park entrance off Rocky Point Avenue in Warwick. It is being co-hosted by the Rocky Point Foundation and the Rhode Island Saltwater Anglers Association. The intent of the event is to get people thinking about possible uses of the park that was recently acquired by the state and to illustrate that people across the state have a stake in its development. It's also meant to be fun and in the process promote a public workshop Tuesday, May 7 at 6 p.m. at Rhodes on the Pawtuxet. This will be the first hearing to solicit ideas for the park's future. Striped bass bite exploded this week with school bass and keepers mixed in being caught in greater numbers along the southern coastal shore with fish moving up into the Bay. Dave Henault of Ocean State Tackle, Providence, said, “A customer caught a 32 striped bass in the Seekonk River Sunday. Not sure if it was a new fish or one that wintered here. The angler that caught it said it was a fairly round fish so it may have been a new migrating fish.” Ken Landry of Ray’s Bait & Tackle, Warwick said, “Customers have not been catching striped bass yet, however, the water is expected to warm this week and bring the fish into the Bay.” If you have not already done so, now is the time to start fishing for spring striped bass, they are here along the coast, in the Bay and will be here in stronger numbers by the end of the week. Tautog fishing reports still trickling in with some keeper fish being cauth in Mt. Hope Bay, India Pint Park in Providence and in the Warren River. Overall tautog fishing is slow, warming water will help here too. Squid are starting to appear. “Some squid are here, customers are catching them but in no great numbers.” said Dave Henault of Ocean State Tackle. The Francis Fleet begins their squid fishing trips this Friday, May 3, contact them at www.francesfleet.com . Herring migrations into our bays, rivers and salt ponds have been heavy this year. As early as four weeks ago Craig Castro of Erickson’s Bait & Tackle said, “The herring are thick in Little Gorton’s Pond behind my shop.” Traditionally Atlantic Menhaden come after the herring, flowed by striped bass chasing them. Let’s hope that this is what happens this week as the water warms. Good cause, great values: Capt. 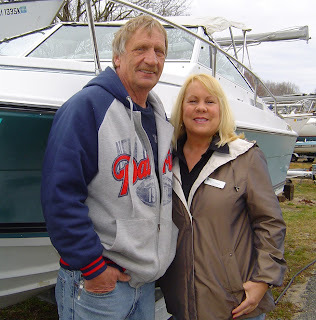 Ray Roberts, Boat Manger and Teri Woodbine of the URI Foundation Boat Donation and Sales Program, offer both used power boats and sail boats for sale in all price ranges like this Four Winns 21.5 footer they are standing in front of. It is for sale for $4,250. The URI Foundation Boat Donation & Sales Program has been in existence for over thirty years. Donated boats are offered to various marine-oriented departments at the University and if no use is found, they sell the boat and place the money into an endowment for support of marine related programs. Donors can also specify a University programmatic end use. And, those donating their boat generally benefit from a charitable tax deduction. Teri Woodbine said that they have a brochure with current inventory and prices for buyers and they take in donated vessel and sell them all year round. Their yard, where you can see inventory by appointment, is at the URI Bay Campus on South Ferry Road, Narragansett. They can be reached at 401.874.5273 or visit them at www.uri.foundation.org . One of the first steps to buying a boat is determining what you want to use a boat for i.e. what type of fishing, family outings, swimming, overnight or day cruising or a combination of uses. The use of the vessel will dictate the type of boat you should buy. The National Marine Manufacturers Association (NMMA) has a great online tool to help you determine the type of boat you might be interested in. It can be found at www.discoverboating.com. This web site will ask you the intended use and relate the advantages and disadvantages of each boat type recommended. Another major decision in the boat selection process is whether to buy a new or used boat. Used boats cost less and are an option for those who are uncertain about boat use. A used boat is also a good option for those who cannot afford to purchase new. Make sure you add the cost of repairs to the purchase price of used boats. A helpful way to determine repair cost is to commission a boat survey. A boat survey is similar to a home inspection. Surveys are conducted by certified surveyors who closely examine the vessels hull, structure, electrical system and engine(s). Engine tests are conducted and running time hours are verified. Surveys but can give you estimates on repairs which you can use to negotiate the sale price. Like automobiles, new boats come with warrantees. If something goes wrong (and with boats something often goes wrong) you want a warrantee behind you. New boats and warrantees are important, particularly if you do not want to spend your time repairing and restoring a boat yourself. Often times old boats need more time to prepare for the season and will have a greater frequency of repair due to their age. A higher frequency of repair means more time off the water. So there are trade-offs between new and used boats. Before you purchase a boat, if possible, take it for a test run under the conditions you intend to use the boat. For example, I like to troll at a slow speed at or below two miles per hour. So, when I test drive a boat I want to see how it runs at two miles an hour, at recommended cruising speeds and how it handles rough seas. The Rhode Island Saltwater Anglers Association (RISAA) will hold a seminar Monday, April 29, 7:00 p.m., at the West Valley Inn, West Warwick on weather for boaters and fishermen with meteorologist Fred Campagna. Mr. Campagna is former chief meteorologist at WLNE-TV ABC6 in Providence and currently owns his own weather service, Right Weather. Also at the seminar, RISAA members Roger and Sue Lema will speak on fishing for striped bass during the annual worm hatches in South County. Capt. Dave Porreca will also speak about fishing the cider worm hatches… with fly fishing gear. Non-members are requested to make a $10 donation to the RISAA scholarship fund, members attend free. The event will be preceded by dinner paid separately and served by the West Valley Inn starting at 5:30 p.m.
On Sunday, May 5 from 10:00 a.m. to 4:00 p.m. at the Wayside Inn, 72 Wayside Inn Road, Sudbury, MA the United Fly Tyers and New England Fly Tyers will demonstrate fly trying skills and teach fly tying to veterans, breast cancer survivors, children and adults. Project Healing Waters and Casting for Recovery will be at the event to answer questions. The “Bug Man”, Bob McMenemy, a trout stream entomology enthusiast, will be on hand with live aquatic insects. For information e-mail ajflyfish@yahoo.com . Birthday trout: Kyra Anderson of North Kingstown turned seven on opening day. 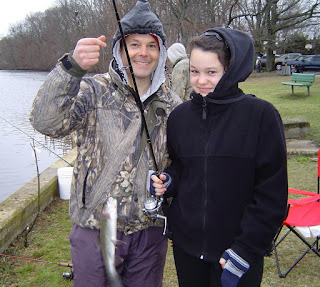 She caught this rainbow trout while fishing with family and friends at Silver Spring Lake, North Kingstown, RI. Family affair: Michaela Dora (right) landed this trout at Willet Avenue Pond, East Providence, RI while fishing with her dad Michael Dora (left). Three generations of the Dora family fished on opening day. Fishing opening day still fun: John Bergantini (91 years old) of Narragansett, RI has fished opening day for 70 years. Opening day this past Saturday didn’t let anyone down. I traveled to ponds in South County and to the East Bay and although the morning was cold the excitement was contagious. 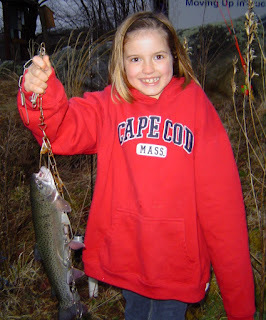 Excitement from the likes of Kyra Anderson… seven years old on opening day… who was the only one in her group that caught a fish and just as she was saying “It’s my birthday!” she reeled her second rainbow trout at Silver Spring Lake, North Kingstown, RI. 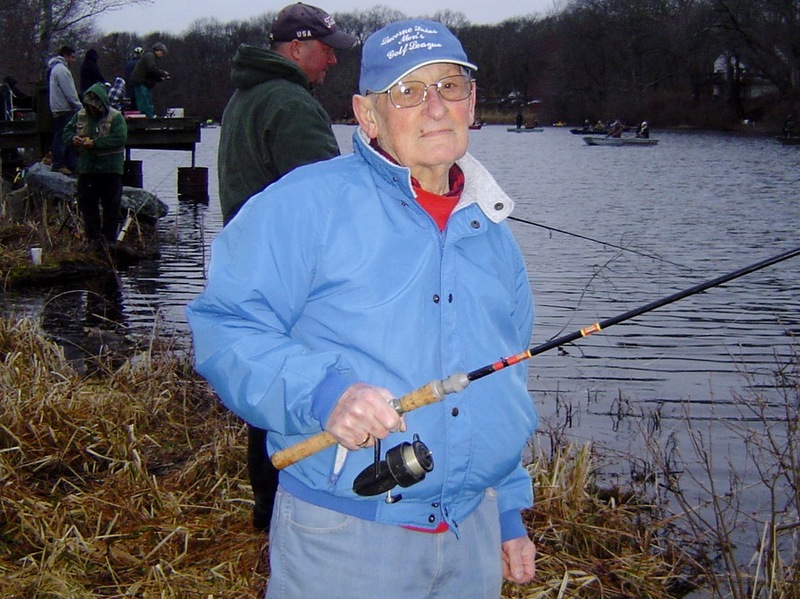 John Bergantini, ninety-one years old, from Narragansett, RI was proud to share, “I’ve been fishing opening day for seventy years.” It was exciting for Michaela Doro of East Providence too. Just as she said, “I am doing pretty good.” her father Michael picked up her rod and she reeled in another trout at Willet Avenue Pond in Riverside. Three Doro family generations fished opening day Saturday. DEM’s Fish & Wildlife Division said approximately 80,000 hatchery- raised brook, brown, and rainbow trout with an average individual weight of one and a half pounds were stocked in more than 100 ponds and streams for opening day (visit www.dem.ri.gov for a complete listing and for license). Business was brisk opening day week for Lorraine Danti, owner, and Manny Macedo, manager, of Lucky Bait & Tackle in Warren, RI. They sold more freshwater licenses than ever before. Macedo said, “The number of both fresh and saltwater licenses has been rising since Lorraine took over the shop in 2007. We believe we are gaining market share too.” Lucky Bait & Tackle is one of the more sophisticated bait and tackle shops I have visited. Their entire inventory is bar-coded. They have a wide selection of fresh/saltwater fishing gear, tackle and bait as well as all types of recreational clam and quahog equipment. They even carry Asian crabs (as well as green crabs) for tautog anglers. The spring tautog season runs from April 15 to May 31 with a 16” minimum size and a three fish bag limit. It is closed June 1 to July 31 during the spawning season and reopens August. Tautog anglers often use soft baits in the spring such as grass shrimp and clam works but green crabs and Asian crabs work well too. The Rhode Island Saltwater Anglers Association (RISAA) will hold a seminar Monday, April 29, 7:00 p.m., at the West Valley Inn, West Warwick on weather for boaters and fishermen with meteorologist Fred Campagna. Mr. Campagna is former chief meteorologist at WLNE-TV ABC6 in Providence and currently owns his own weather service, Right Weather, which offers in-depth weather coverage on a website and through multiple wireless media outlets. Also at the seminar, RISAA members Roger and Sue Lema will speak on fishing for striped bass during the annual worm hatches in South County. Capt. Dave Porreca will also speak about fishing the cider worm hatches… with fly fishing gear. He is owner of River & Riptide Anglers, a fishing guide business. Non-members are requested to make a $10 donation to the RISAA scholarship fund, members attend free. The event will be preceded by dinner paid separately and served by the West Valley Inn starting at 5:30 p.m. The URI Foundation boat donation and sales program will hold an open house Saturday, April 20, 9:30 a.m. to 1:00 p.m. at the URI Bay Campus, South Ferry Road, Narragansett, RI. Visit the open house and see the great boat inventory and values they have. For more information visit their website at www.urifoundation.org or contact Teri Woodbine, Boat Program coordinator at 401.874.5273. DEM posted final 2013 saltwater fishing regulations last week with some liberalization to scup and fluke regulations but more restrictive regulations on black sea bass as Rhode Island has to take a 32% reduction in total catch. Here are regulation highlights, for a complete listing visit DEM’s web site at www.dem.ri.gov. Black sea bass: 13” minimum size, June 15-Aug. 31, 3 fish/person/day; Sept. 1 – Dec. 31, 4 fish/person/day. Bluefish: no minimum size, no closed season, 15 fish/person/day. Cod: 22” minimum size, no closed season, 10 fish/person/day. Summer flounder (fluke): 18” minimum size, May 1-Dec. 31, 8 fish/person/day. Scup (shore and private), 10” minimum size, May 1- Dec. 31, 30 fish/person/day; Special area provisions (this is new)… while fishing from shore at India Point Part, Providence, Conimicut Park, Warwick or at Stone Bridge, Tiverton, anglers may possess up to 30 scup 9 inches or greater in length from May 1 to Dec. 31; Scup (party and charter boasts), 10” minimum size, May 1 –Aug. 31, 30 fish/person/day, Sept. 1-Oct. 31 45 fish/person/day and Nov. 1-Dec. 31, 30 fish/person/day. Striped bass: 28” minimum size, no closed season, 2 fish/person/day. Tautog: 16” minimum, April 15-May 31, 3 fish/person/day; June 1 –July 31, CLOSED; August 1 –Oct. 19, 3 fish/person/day and Oct. 20-Dec. 15 6 fish/person/day (maximum of 10 fish/vessel during all periods)… Tautog (party and charter), same spring seasons and closed periods as recreational plus Aug. 1-Oct. 14, 3 fish/person/day and Oct. 15-Dec,. 15 6 fish/person/day (no vessel maximum). Weakfish (squeteague), 16” minimum size, no closed season 1 fish/person/day. Fresh water fishing got off to a great start this week. John Wunner of John’s Bait & Tackle, North Kingstown said “A customer weighed in a 2 pound 15 once rainbow trout caught at Hunts River in North Kingstown.” Manny Macedo of Lucky bait, Warren, RI said, “We sold more fresh water licenses and trout stamps that ever before.” Thirty minutes into opening day , Rocco Dangelo of South Kingstown had caught two trout already. Visit www.dem.ri.gov for a listing of ponds and lakes that have been stocked. Trout fishing is expected to remain good. Tautog season started Monday, April 15. Bait shops throughout the area have fresh green crabs, clam worms and some are now stocking Asian crabs… all good tautog baits for spring .